Archbishop Anil Joseph Thomas Couto was born on the 22nd of September 1954 in Goa as the third child of Avito Piedade Jose´ Couto and Ernestina Isabel Lobo e Couto. He hails from the villages of Aldona-Pomburpa´ in Bardez, Goa. He has three brothers. He was educated initially at the Government Primary School and thereafter at St. Elizabeth’s High School at Pomburpa´, Goa. He did his ecclesiastical studies at the Seminary of Our Lady at Saligao and his philosophical studies at the Patriarchal Seminary at Rachol in Goa where he answered the Lord’s call to work as a priest in the mission territory of North India and opted for the Archdiocese of Delhi after his regency at Boys’ Town, Quepem, Goa. He joined the Archdiocese of Delhi in June 1977 and after completing his theological studies at Vidyajyoti College of Theology in Delhi, was ordained a priest on the 8th of February 1981. After a year of Hindi studies at Varanasi he was appointed as Priest-in-Charge of the Rohtak Mission in North Haryana in1982. In 1988 he took over as the Principal of St. Michael’s Junior School, Prasad Nagar, and was simultaneously serving as Assistant Parish Priest at St. Michael’s Church, Prasad Nagar, New Delhi. In 1991 he was appointed as Rector of Pratiksha, the Archdiocesan Major Seminary. Thereafter, Fr. Anil Couto was sent to Rome to do his doctorate in Ecumenical Theology. From June 1998 onwards he was Rector of Vinay Gurukul, the Archdiocesan Minor Seminary at Gurgaon in Haryana. In 1999, the late Archbishop Alan de Lastic appointed Fr. Anil Couto as one of the Episcopal Vicars of the Archdiocese of Delhi. 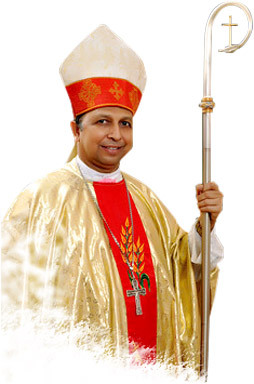 On the 17th of January 2001 the Holy Father, Pope John Paul II, appointed Father Anil Joseph Thomas Couto as the Titular Bishop of Cenculiana and Auxiliary Bishop of Delhi. In April 2007 the Holy Father Pope Benedict XVI transferred Bishop Anil Couto to Jalandhar as its Bishop and on the 20th January 2013 Bishop Anil Joseph Thomas Couto returned to Delhi as its Archbishop and was installed on 20th January 2013 at the Sacred Heart Cathedral. His Grace has an enriching experience as a pastor and preacher. He is a spiritual leader, dynamic enabler and is compassionate at heart. He retains his lovableness, humility and simplicity whether he is dealing with rich and exalted or with the humblest and the poor. His Grace is the true father in God, ready to share their joys and help in sorrow. He is a person with a golden tongue acceptable to all people irrespective of caste, colour and religious commitments. The day that anyone makes his acquaintance is always a memorable one in that person's life. There are few who leave his gracious and venerable presence without feeling inspired and encouraged. "SARIYANTE SARE EK HO JAAN"